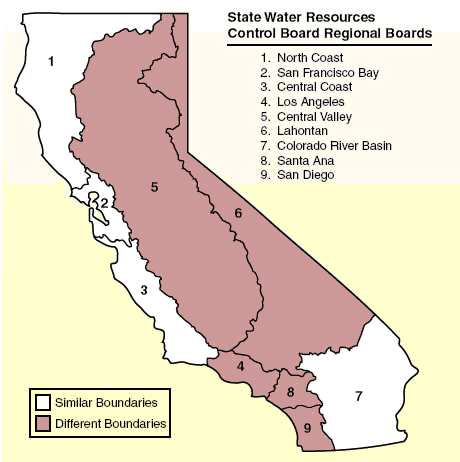 There are nine regional water quality control boards (regional water boards) that administer federal and state water quality regulations in California (fig.1) and each has taken a different approach to controlling runoff from agricultural lands. Currently, four regional water boards (3, 4, 5 and 9) have adopted a “conditional waiver” or “conditional ag waiver” for irrigation runoff. Ag waiver programs are state programs that require the owners of irrigated farmland to control discharges (irrigation and stormwater runoff) from their property to protect surface and groundwater. A waiver is good for five years and is “conditional,” meaning that it can be revoked at any time. Growers are required to adopt Best Management Practices (BMPs) to prevent pollutants from entering water bodies, and check lists of BMPs are required in Region 3 and Region 4. Groups, watersheds or individuals must monitor water where agricultural lands drain to assess the impacts of discharges from irrigated lands. Property owners, employees or other farm representatives are required to complete farm water quality education. In Region 3, growers are also required to develop a farm water quality plan. Recently, a significantly stricter ag waiver program has been proposed for growers in Region 3, while the bar is being raised in Region 4 with the adoption of a new waiver last October. The Central Coast Region extends from Santa Clara County south to northern Ventura County, including 378 miles of coastline (fig.2). The Central Coast Region includes all of Santa Cruz, San Benito, Monterey, San Luis Obispo and Santa Barbara counties; it also includes the southern part of Santa Clara County and small portions of San Mateo, Kern and Ventura counties. The Central Coast of California is one of the most productive and profitable agricultural regions in the nation, reflecting a gross production value of more than six billion dollars in 2008. More than 1,800 growers and farming companies participate in the current waiver program, representing 390,000 acres or 95 percent of the commercially farmed land in the region. Monitoring has been conducted individually or through participation in the Cooperative Monitoring Program (CMP). The CMP has been managed by the Central Coast Water Quality Preservation, Inc., a non-profit corporation founded by farmers to operate the CMP on behalf of irrigated agriculture on the Central Coast. Monitoring sites have been in receiving waters, primarily with agricultural drainage.  The conditional waiver was first established in July 2004 and expired in July 2009. A one-year extension of the waiver was approved. Because ag waiver monitoring data continued to exceed water quality objectives with impairment of surface and groundwater (including drinking water contaminated by nitrates from fertilizers), the Central Coast regional water board developed a new draft waiver last February which required on-farm monitoring to ensure compliance and identify farm operations that are pollution sources. Growers were concerned about the amount of recordkeeping that was proposed, requiring individual on-farm monitoring that was subject to public scrutiny. Growers were also concerned that the plan did not consider the different types of agriculture, irrigation methods, topography and geography in the region. Furthermore, the draft proposal posed special challenges for nursery growers. For example, the original proposal would have required separation of rainwater from container plants, which meant that some outdoor nursery growers would have had to construct greenhouses in areas where greenhouse permits are impossible or difficult to obtain. In July 2010, the Central Coast water board extended the ag waiver another year so that alternative plans for a new waiver could be examined. A coalition of more than 50 farm groups and individual growers presented alternative plans that the board considered along with alternative plans proposed by other groups. Tier assignment. Tier 1 is the lowest risk group and applies to farm operations that do not use chlorpyrifos or diazinon and are not located within 1,000 feet of an impaired surface waterbody listed for agricultural pollutants. In addition, if the farm produces the row crops that the Central Coast water board deems as high risk, the total irrigated acreage must be less than 1,000 acres. Tier 2 applies to all farm operations that discharge a moderate level of waste or that the board deems as posing a moderate threat to water quality, do not meet the Tier 1 or Tier 3 criteria, and meet one the following sets of criteria: (1) The farm operation is located within 1,000 feet of an impaired surface waterbody listed for agricultural pollutants, but total irrigated acreage is less than 1,000 acres and the discharger does not use chlorpyrifos or diazinon; (2) The discharger does use chlorpyrifos or diazinon, but the farm operation is not located within 1,000 feet of an impaired surface waterbody listed for agricultural pollutants and the total irrigated acreage is less than 1,000 acres; or (3) The operation total irrigated acreage is e”1,000 acres, but is not located within 1,000 feet of a surface waterbody listed for agricultural pollutants, does not include any of the row crops that the board deems as having a high potential to discharge nitrogen to groundwater, and the discharger does not use chlorpyrifos or diazinon. Tier 3 applies to all farm operations that discharge a high level of waste or that the board deems as posing the highest threat to water quality, and meet one the following sets of criteria: (1) The total irrigated acreage is e•1,000 acres and includes crops deemed as having a high potential to discharge nitrogen to groundwater or the discharger applies chlorpyrifos or diazinon; or (2) The farm operation is adjacent to or contains a waterbody listed for agricultural pollutants and the discharger applies chlorpyrifos or diazinon. Requirements for all tiers. All farm operations must sample private domestic and agricultural supply groundwater wells on their operations and conduct receiving water quality monitoring (i.e. sites where agricultural lands drain). Receiving water quality monitoring can be conducted by participating in a cooperative monitoring program (e.g., the Cooperative Monitoring Program developed for the 2004 Agricultural Order). As in the previous waiver, all dischargers must have a farm water quality management plan which must be updated at least annually and complete water quality education requirements (15 hours within 18 months of the adoption of the order or enrollment). Additional requirements for Tier 2 and Tier 3. There are photo documentation requirements for dischargers with operations adjacent to or containing an impaired waterbody identified for temperature, turbidity or sediment. Photo monitoring must document the condition of streams and riparian and wetland area habitat, the presence of bare soil vulnerable to erosion, and relevant mitigation measures. Tier 2 and 3 dischargers must also prepare an additional report, the Annual Compliance Document, to provide up-to-date information to assist the board in the evaluation of threat or impact to water quality from agricultural discharges and evaluate progress towards compliance. Included in the requirements for the Annual Compliance Document, Tier 2 and Tier 3 dischargers must report nitrate loading risk factors and overall nitrate loading risk calculated for each ranch/farm or nitrate loading risk unit. The nitrate loading risk factor is a measure of the relative risk of loading nitrate to groundwater. The nitrate loading risk unit may be the total ranch, a number of blocks or an individual block. Within two years from adoption of the order or enrollment, Tier 2 and Tier 3 dischargers with high nitrate loading risk must record total nitrogen applied per crop, per acre to each farm/ranch or nitrate loading risk unit; by October 1, 2014 this must be reported in the Annual Compliance Document. Additional requirements for Tier 3. Within one year from adoption of the order or enrollment, Tier 3 dischargers with a high nitrate loading risk must determine the typical crop nitrogen uptake for each crop type produced and report the basis for the determination; within two years, these dischargers must (1) develop and initiate implementation of an Irrigation and Nutrient Management Plan (INMP) certified by a Professional Soil Scientist, Professional Agronomist or Crop Advisor, or (2) propose a discharge groundwater monitoring and reporting program (GMRP) plan to evaluate waste discharge to groundwater from each ranch/farm or nitrate loading risk unit and assess if the waste discharge is of sufficient quality that it will not cause or contribute to exceedances of any nitrate water quality standards in groundwater. There are detailed requirements for the INMP and information to be included in the Annual Compliance Document. There are also specific documentation requirements within three years of the adoption or enrollment of the order to demonstrate improved irrigation and nutrient management efficiency, improved nitrogen balance ratios, and reduced nitrate loading to groundwater; within five years, there are specifications to demonstrate overall effectiveness. Furthermore, Tier 3 dischargers with operations adjacent to or containing a waterbody identified on the 2010 List of Impaired Waterbodies for temperature, turbidity or sediment must submit a Water Quality Buffer Plan that protects the listed waterbody and its associated tributaries; all Tier 3 dischargers must conduct individual discharge monitoring and submit individual discharge monitoring reports. The ag waiver order becomes effective on March 17, 2011 and the deadline for comments was January 3, 2011. The board received a draft alternative proposal on behalf of seven county farm bureaus and various other groups, including the California Cut Flower Commission (CCFC) and the California Association of Nurseries and Garden Centers (CANGC) on December 3, 2010. Flower and nursery growers representing CANGC and the CCFC also prepared and submitted an additional comment letter to the board. They hope to work with the board to come up with a mutual resolution of the water quality issues within the Central Coast regional watershed. 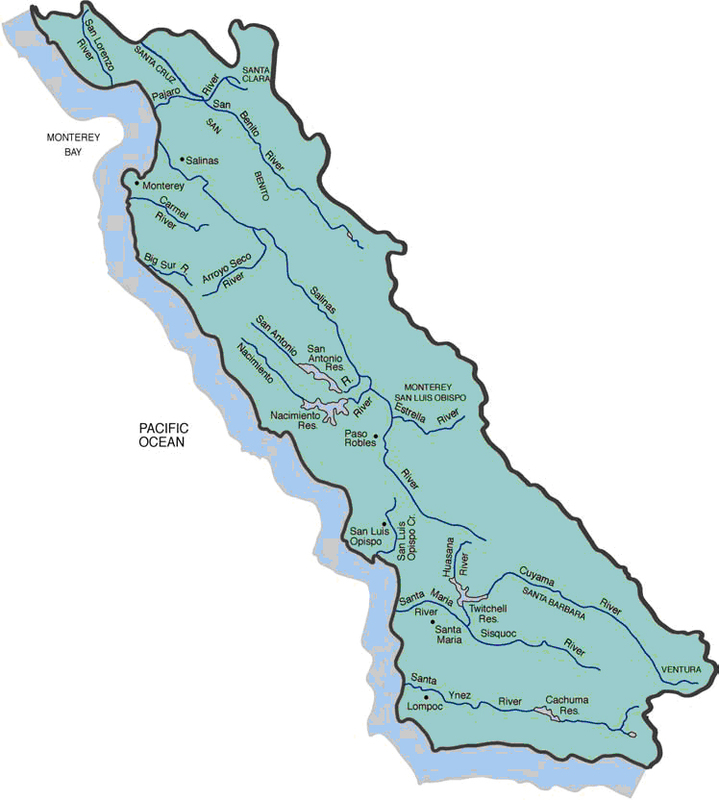 The Los Angeles Region is the most densely populated water quality region in the state. It includes all the coastal watersheds of Los Angeles and Ventura Counties, and small portions of Kern and Santa Barbara Counties (fig. 3). There are two group waivers in this region: Nursery Growers Association-Los Angeles County Irrigated Lands Group (NGA-LACILG) and Ventura County Irrigated Lands Group (VCAILG). The largest program is VCAILG, which is coordinated by the Ventura County Farm Bureau. It includes about 1,486 of Ventura County’s 1,646 agricultural landowners and represents about 92% of the irrigated agricultural acreage (approximately 125,000 acres total). The monitoring program is conducted in receiving waters and most monitoring sites capture runoff from only irrigated agricultural land. The cost of the program is divided among growers and is based on acreage. Since 2006, VCAILG spent $1.3 million— an average of $15 per acre for members. The Nursery Growers Association developed the NGA-LACILG waiver program. As of July 2009, there were 237 enrolled sites comprising about 2,232 acres. Monitoring is conducted on nursery sites. Current waiver fees are $950 for nurseries under five acres and $1,450 for parcels over five acres. Late fees apply. Click on thumbnails to view entire figures. Fig. 1. The Porter–Cologne Act established the State Water Resources Control Board as the statewide water quality planning agency and gave authority to nine Regional Water Quality Control Boards. Fig. 2. The Central Coast Region extends from Santa Clara County south to northern Ventura County, including 378 miles of coastline. Fig. 3. 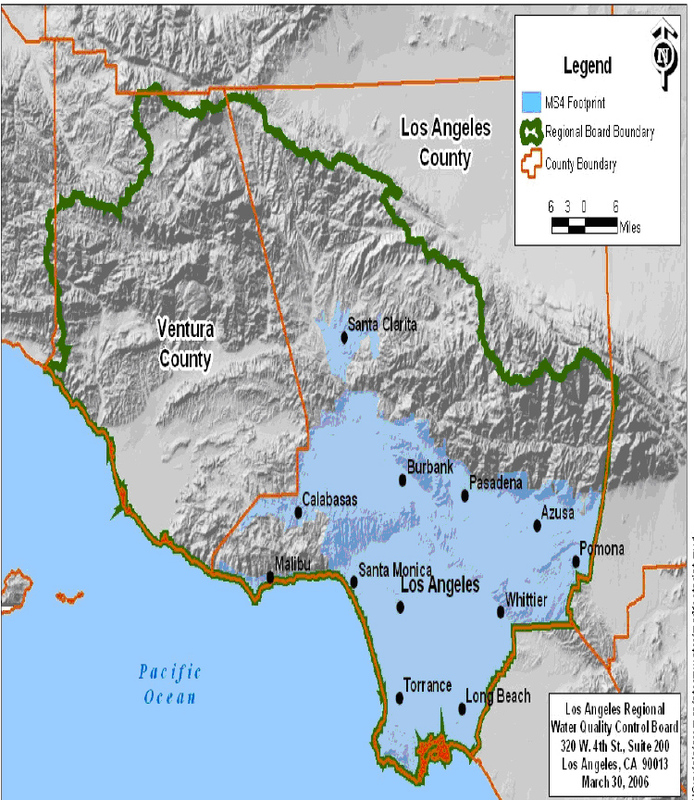 Region 4 boundary (delineated in green) includes all the coastal watersheds of Los Angeles and Ventura Counties, as well as portions of Santa Barbara and Kern County.